Grassroot Soccer uses the power of soccer to connect young people with the mentors, information, and health services they need to thrive. A love of football has been a constant in Coach Athi’s life, and a way to deal with challenges. She’s now using her passion to be a role model for younger girls. Our approach addresses what adolescents need to live healthy lives. Through flagship sites and partnerships, Grassroot Soccer programs have been implemented in nearly 50 countries and across many cultural settings. We believe in teamwork – discover more about our people and our organization, along with our latest news and resources. Grassroot Soccer is grateful to The Bill and Melinda Gates Foundation for being one of our first supporters. The Bill and Melinda Gates Foundation was a key donor for our first year of programming in Zimbabwe in 2003, and supported the Children’s Health Council to complete a rigorous evaluation of the GRS curriculum and overall model. The evaluation concluded that the Grassroot Soccer curriculum is a “culturally appropriate, internationally suitable, creative, effective way to educate at-risk youth about HIV/AIDS and its prevention.” In 2005, The Bill and Melinda Gates Foundation then invested in the scale up of GRS programs in South Africa, Zambia, Zimbabwe, and Botswana. Grassroot Soccer is a current partner on a Gates Grand Challenges award in South Africa, implementing a project focused on increasing sexual and reproductive health knowledge and school retention among adolescent girls. Bohemian Foundation is a private family foundation that supports local, national, and global efforts to build strong communities. Bohemian Foundation’s four program areas are Community, Music, Global, and Civic aimed at empowering citizens and impacting communities. The Bohemian Foundation has been a key supporter of GRS’s comprehensive programming in Zambia, focusing on among other areas; behavior change education, access and linkage to health services and support groups for young people living with HIV, as well as organizational development. The ELMA Foundation’s mission is to improve the lives of Africa’s children and youth through the support of sustainable efforts to relieve poverty, advance education and promote health. With generous support from ELMA and strong partner organizations, GRS is expanding its school-based prevention education, testing services for adolescents, and linking of HIV-positive adolescents to the care and support services in Gauteng, South Africa, with the aim to increase self-efficacy, gender-awareness and knowledge of HIV and sexual and reproductive health and rights. The ExxonMobil Foundation supports programs that target global health issues, specifically malaria, because it believes that good health is a springboard to opportunity, achievement and development. Grassroot Soccer and ExxonMobil have been working together since 2011 to deliver malaria and HIV prevention education to youth in Nigeria, Tanzania, and Equatorial Guinea. ExxonMobil additionally supports GRS all-girls sexual and reproductive health programming in South Africa, and has helped GRS form a partnership with Special Olympics to design and implement a malaria and HIV prevention program for youth with intellectual disabilities in Nigeria. Grassroot Soccer's multiple USAID-funded partnerships with FHI 360 will reach over 40,000 adolescents in 2019. This includes work in South Africa delivering socio-economic strengthening and HIV prevention interventions for orphans and vulnerable youth and their households, under the BRIDGE Project - Support, Prepare, and Engage Vulnerable Youth II. GRS is also working with FHI 360 in South Africa to deliver a gender-based violence prevention and response program for adolescent girls and young women and community leaders, and facilitates linkages to services for survivors of violence, all under the DREAMS - Community Mobilization and Norms Change II project. GRS has been working with FHI 360 in Zimbabwe since 2017 under the USAID/PEPFAR DREAMS Initiative to implement SKILLZ with very young adolescent girls as part of the “Adolescent Girls & Young Women Health for Life 360” project. The Ford Foundation seeks to reduce poverty and injustice, strengthen democratic values, promote international cooperation, and advance human achievement. Ford Foundation achieves these goals through focusing on three areas – investing in individuals, building institutions, and supporting new ideas. Grassroot Soccer is a proud recipient of funding from the Ford Foundation since 2013, enabling GRS to deliver comprehensive sexual and reproductive health education to youth in South Africa and disseminate program findings and best practices. Grassroot Soccer is partnering with mothers2mothers (m2m) on a new 5-year USAID “Children and Adolescents are My Priority” project in South Africa to provide SKILLZ programs to both in- and out-of-school orphans and vulnerable youth. Working together with m2m, we will deliver Grassroot Soccer's ART adherence program (SKILLZ Plus) to nearly 10,000 adolescents living with HIV during the project’s first year in 2019. 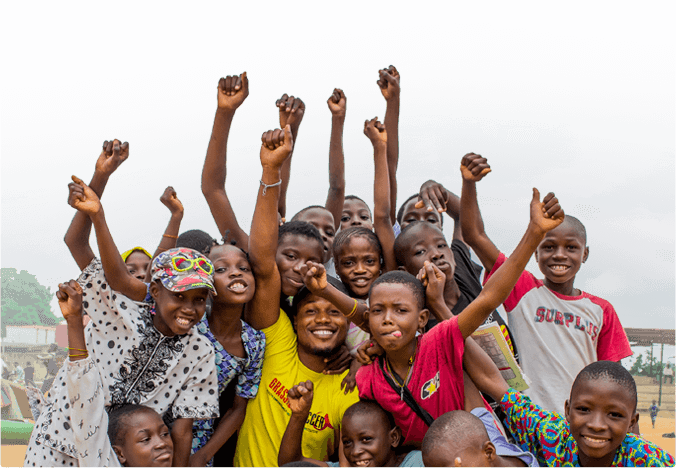 Nike Global Community Impact is supporting Grassroot Soccer and Youth Empowerment Development Initiative (YEDI) to deliver SKILLZ programs, testing tournaments, and holiday camps to vulnerable youth throughout Nigeria. Nike support is enabling YEDI and GRS to attract new school partners in key geographies. In 2011, Grassroot Soccer and the Peace Corps formed a global partnership that provides Grassroot Soccer SKILLZ curricula, training, and materials to Peace Corps Volunteers. Volunteers deliver tailored Peace Corps SKILLZ programs to some of the world’s most in-need communities, where soccer is often a strong community unifier and youth desperately need access to accurate health information and caring adults. Since the launch of the partnership in 2011, more than 2,000 Peace Corps Volunteers in 46 countries have worked in tandem with Grassroot Soccer and local community member GRS Coaches who deliver key life skills information to youth. US Agency for International Development (USAID) is the lead U.S. Government agency that works to end extreme global poverty and enable resilient, democratic societies to realize their potential. The U.S. President's Emergency Plan for AIDS Relief (PEPFAR) is the U.S. Government initiative to help save the lives of those suffering from HIV/AIDS around the world, the largest commitment by any nation to combat a single disease internationally. Since 2008, support from PEPFAR through USAID has been vital to Grassroot Soccer’s development and expansion in southern Africa and has enabled GRS to design, implement and monitor high impact combination prevention initiatives for adolescents. The partnership has also entered into multiple public-private partnerships, delivering joint projects with private partners including Nike, Comic Relief, The MAC AIDS Fund, Barclays, and Anglo American. The charitable arm of energy trading company Vitol, the Vitol Charitable Foundation supports projects that promote better living conditions for children living in deprivation. To achieve this, the Foundation supports charity partners that work in four key areas of a child’s development: Health, Water and Sanitation, Education and Livelihoods. Vitol Charitable Foundation works with Grassroot Soccer Zimbabwe to provide targeted health education to youth and facilitate access to youth-friendly health services. This special report summarizes some of our completed research activities to date. Curious what we've been up to recently? Here's the latest news and stories. She’s making a difference in the lives of adolescents in Zambia.